Motorcyclists have the odds stacked against other vehicles. Their small size means they’re less likely to be seen in busy traffic situations. Their lack of a protective cage means their riders are more likely to suffer a serious or fatal injury in an accident. Their two wheels make them less stable on poor road surfaces and wet pavement. For these reasons, motorists should not drive around them as they would other cars. 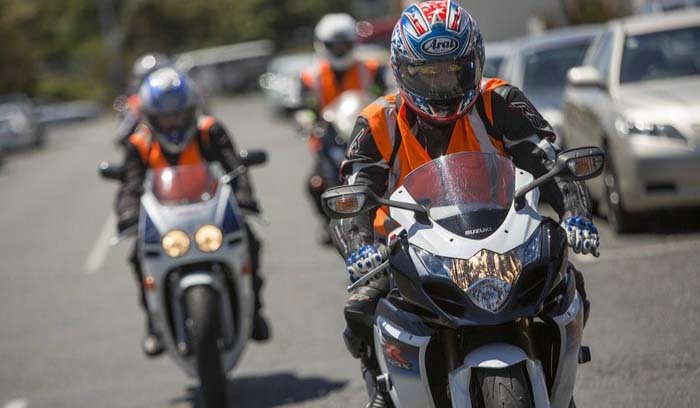 Safely sharing the road with motorcyclists requires giving them special consideration like you would to pedestrians. Tailgating reduces your reaction time. 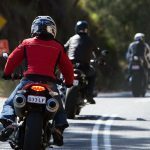 If you are caught off guard and bump into a motorcycle, it may knock the rider off, causing a serious injury. Rear ending a motorcycle while stopped at an intersection may “sandwich” the rider between your car and the one in front. There is no such thing as a fender bender with motorcycles. Allow four seconds of distance between your car and a motorcycle in front. When a motorcycle passes by a fixed object or over a shadow, count off the seconds it takes for you to reach it. Motorcycling in the rain on wet pavement is tricky. The biker can’t lean as much into his turn and can’t afford to brake too hard. Unlike a car, when a motorcycle skids even a little, the result is often a fallen biker on the road in front of you. Besides the fact that this is illegal, motorcycles need the entire width of the lane to dodge potholes and debris. Hitting either of these can cause the motorcycle to crash. This is why they often weave in their lanes. Check your rear view mirror for any motorcycles that are rapidly overtaking you, and then turn your head to check your blind spot. Don’t forget to signal. When crossing an intersection, look twice. Look once for all types of traffic, and then again just for bikers. When turning left at an intersection, make sure you aren’t going to cut off a motorcycle. A left turn into a motorcycle is a common accident that causes many fatalities. Share the road with motorcycles by giving them extra consideration. The biker may be someone you know. 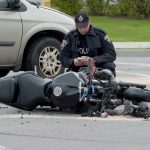 ‹ What Kind of Gear Should You Use to Prevent Injuries in Motorcycle Accidents?